Never again without: ORTLIEBS First Aid Kits should be an inherent part component of your equipment. The First Aid Kits are waterproof sleeves made of PU-coated nylon fabric with roll closure, and are available in four different sizes and safety levels (Regular, Medium, High, Ultra-high). Regular and medium are suitable for most outdoor activities. Safety Level “High” contains (in addition to the basic) supplementary equipment required for a specific field of sport: motor biking, cycling, trekking, canoeing/kayaking, horse riding. 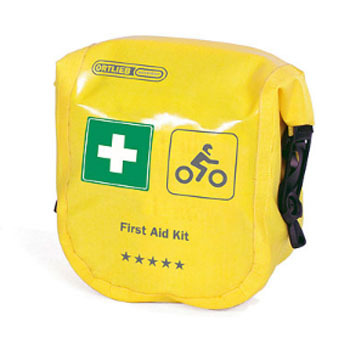 The well stocked Ultra High version allows optimal first aid for trekking and cycling sports, and is also designed for small groups. All kits feature belt loops. The models High and Ultra High have additional straps for fixing to a backpack etc. • Can be fixed to bag, motorbike, belt, etc.